He'll correct me if I'm wrong, but I believe Peter never includes the peen block in his construction. Thanks Vincent, that's good to know. Guess I'll try some other possibilities to size the quillons! I thought I set up the golden ratio, but I made a mistake and found the with of the blade. The green circles are half the size of the blue circles. With sword Nr 1. I was unable to find all the dimensions: I was unable to find the position and dimensions of the pommel and the width of the cross guard. For sword Nr 2. I was also unable to find the position and dimensions of the pommel. I could find the curve of the cross-guard, but it felt like guesswork, so I left those lines out. It looks like I may have gone wrong by including the peened end of the tang within the base geometry. Another experiment, this time to try to reconstitute a excavated french rapier that I talked about in another topic: pictures here. Total length was made with 9,5 x diameter (or 9 circles and 1 vesica). The blade cross-section changes from hexagonal to flattened diamond 2 circles before the tip (i.e. at 7 circles and 1 vesica). The central fuller is 4 circles long, the two lateral fullers are 2 circles long. The quillons are inscribed into the hexagon of the great circle. Blade width is 1/5th of the small circle diameter (or 1/10 of the great circle). The ricasso length was also delimited by the hexagon. Wow, the scale drawing is very impressive! I'd usually say that rapiers like that are getting to be outside my time period of interest, but this looks very cool. Please excuse my interruption...Geometric theory is interesting, but surely it also needs to be taken in context with a swords distal taper. Distal taper seems to be the red headed stepchild of the sword world, the least referenced in literature, yet probably the most commonly criticised fault in many reproductions. It would be nice if more authors would publish information on distal taper. Very few of us actually get the opportunity to study authentic examples of period swords. Thanks! In fact I think I'll try to draw at full scale from now on... it is far more precise and gives a better idea of the "true" size of the weapons it could be! Just can't get enough of sword geometry. I designed my own type XIV based on my hand size and it looks extremely nice! Of course, the photograph angle is not so good, and the perspective is not right, but it looks good. Looks very nice. I'll try to get some official dimensions for this one, and I'll be able to verify if this model works on it! A possible example of the consequence of geometry deciding the proportions of the outline of a sword and how it has to be forged to meet those proportions can be seen in the well known Oakeshott XIII.4 sword. This was a sword that Oakeshott published in his "Records" but that for a number of years disappeared into unknown location as part of one or several private collections. It emerged again recently and was part of the exhibition "The Sword - Form & Thought" in Solingen that I helped curate. When it came to light again, it had met a strange fate. Oakeshott gave an incorrect number for the length of the blade, but also make a drawing of what it looked like when he saw it. It turns out that some collector saw fit to add a length to the blade to make it meet the dimension given by Oakeshott (some 14 cm longer than actual original length). This is clearly visible in x-ray, where the new tip has been welded on. In the illustration you can see how the sword with its original length neatly fit a simple geometric structure, but also how it in its new lengthened form, fails to meet any geometry in a satisfying way. If you just look at the sword it might come across as odd and perhaps even ungainly in its proportions, but knowing the underlying geometry you can appreciate that there is an original sense of beauty that defines it. To make it possible for the pommel to be as large as the geometry sets out, it is made very thin. It is nearly 7 cm wide, but only 1 cm thick. If you take two digestive biscuits together they will be thicker in proportion to their diameter than this pommel is. I think this may well be a result of a design defined by geometry that results in some creative and original solutions by the sword smith. with a little side note that this strange fate was not detected by measurement but was already known before. but it is of course very nice to see that the wrong length could be "confirmed" with the theory. You are correct of course. I am sorry if my post was misleading. This was never my intention, rather to keep the presentation short. I hope I have not caused sorrow by being unclear in this. We knew the sword was lengthened (since you pointed this out to me!) and the x-ray proved it beyond any doubt and also gave some insight to the shape of the point on the original blade. It was however interesting to see how well the original proportions met with a simple geometric structure, while the lengthened version resisted simple coherent definitions. not a big deal, it was just a little side note for completeness, nothing more. I think it's great to see that your theory really works. btw Is it possible to use the theory to determine the exact length of a broken and incomplete blade. I do remember a brief discussion we had about the reconstruction cq blade length of the Uppsala sword. I think this approach of analyzing swords according to the geometric theories of their time is a major breakthrough. However I also think that trying to categorize strictly such designs, or trying to find strict categories, would inevitably fail. This because we have swords from different areas and time periods, created by different complexes of smith and cutlers, people with different levels of theorical skills and creativity, operating with commercial constraints in mind (in my area for example the middle age and later age are characterized by a system of family small industries quite similar to the german modern model of the mittelstand). So we will probably find different level of application of the geometrical knowledge available for any producer in a determined area and time period. I think that what has emerged so far clearly demonstrates that producers were well aware of geometry, and this matches for Italy what is known of the bottega (shop, literally) system: young boys were apprenticed to an experienced professional, a guild member, who would raise them exchanging a transmission of knowledge for their work of support who would evolve into professional work after years of apprenticeship. Such shop masters would teach them not only the art but also math and geometry adn writing etc. This is how the famous italian painters were raised, for example, and this system could produce painters of the caliber of Leonardo or Titian, and it is well known that they were well versed in geometry and math, geometry being important then for painters. But as you have excellent and mediocre or average painters, so we might apply the same judgement to smiths and cutlers, obviously considering that the guild system was ever guaranteeing that a substantial minumum level of professionalism be present in every master. At this point, as for painters, we are likely to find a liberal, non strict application of the geometrical principles available for study to professional in their environment and time period. First one remark on an important principle for the analysis: the rivet block is never included in the analysis. -So why not include the rivet block? As a sword maker you will know that this is a buffer zone added to the pommel to make future dismounting of the sword easier. If you need to dismount the hilt, you can file away the rivet peen and the top of the rivet block without having to file into the pommel or lengthen the tang or rivet shank when you put the sword together again. You simply use a slightly shorter rivet block. Therefore the rivet block is not part of the basic proportions of the sword. It is an expendable part of the sword whose prime purpose it is to be worn down over time. Why even search for systems or patterns within the patterns? There are several reasons as why I have chosen to do this in my analysis of original swords. It is certainly possible that swords were designed according to other principles than the ones I have distilled from those I suggest. It is also possible and probable that at least some swords were made without any underlying system of design at all. However, we must remember that most swords made during the period were made by professionals in a number of large centres of manufacture, who's education and training was regulated as part of the manufacture. Research has shown that architects and master masons followed very similar principles in their work, over time and geographic distance. They were all part of a system of training, just like the artisans who made swords. It is not far fetched to suggest that there were strong common ideas that guided the work of these masters. In searching for a system of design I have looked at surviving designs that are documented and proven. I have strived to use only such strategies of geometric development that are present in these designs and therefor available to medieval artisans. Robert Bork has observed that the geometric armatures used in the design of ecclesiastic architecture showed strong similarities over time and across geographical distance. Even though there were variations in the structures they shared similar basic principles. Perhaps we see a difference in traditions also in the making of swords? The goldsmith Hanns Schmuttermeyer writes that the use of geometric design should follow certain rules. We may surmise that these rules included the Euclidian principles for geometry, but also some further rules of thumb as can be attested by resent analysis of medieval art and architecture. It is therefore important to keep in mind that medieval artisans were trained in traditions that valued rules and principles and in searching for common themes we can strive to reconstruct them. It is natural to suggest that these principles may have varied per time and between locations, but if architecture and art is to serve as examples, there were strong common traits and reoccurring strategies favoured by the masters. By using well know and proven strategies of development observed in art and architecture we do not risk to stray far outside the realm of the possible. So why do I suggest that three basic structures were commonly used for the design of swords? One important reason is that already at an early stage in this project they turned out to be commonly occurring. These structures were also congruent to certain types of swords and furthermore showed a tendency to follow a chronological development. The alternative placings of the guard in the centre or periphery of the circle follow the rules set out by Hanns Schmuttermeyer in his "Fialenbuchlein" (published in the late 15th century) and is also in accordance to Euclid (who´s philosophy was known and admired in the period). Using the centre of the first vesica is also an important geometric principle (the first theorem of Euclid is defining an equilateral triangle using the vesica). The vesica is perhaps the most basic geometric construction used by artisans since it allows you to establish a true angle between two lines: the start of many (or most?) theoretical and practical constructions. The three basic lay outs therefore make use of three central geometric concepts: the centre and periphery of the circle and the vesica. We see the same principles for setting out in surviving geometric constrictions from the period. I must stress the fact that I have not invented these principles for lay out: they are principles seen in the lay out of church buildings, applied in a way that makes sense for the proportions of swords. These three positions of the guard are directly available after making the first series of circles that lay out the overall proportions of the sword by walking a series of circles down a straight line. This is the first operation in most geometric lay outs. No further construction is needed. To place the guard somewhere else in the structure demands further constructions and is therefore less elegant and more complex. Therefore, using Occams razor we will be informed that these three basic principles are the most likely basic principles for lay out. Another central idea to medieval aesthetic philosophy was that all things should come together in a harmonious whole that was made up of parts according that were set in distinct ratios and harmonic proportions. This was the order of Creation and the principle for macrocosm and microcosm. If you were tasked to create something important, it is reasonable and even obvious that you would base your design on this assumption of the Correct Order of Things. When we today develop geometries in attempts to find underlying structures of design it is important that we observe these same principles. If the geometric structure is chaotic and overly complex with many unique exceptions, it is less probable that it is true to the mindset of a medieval artisan, who tended to seek simple, coherent and balanced designs that expressed commensurable and harmonic proportions (since this is one of the prime reasons you use geometry in the first place). An underlying structure that defines the beginning and end of the object with all important pats included and defined in harmonious ratio to the first defining element is much more probable and also true to the mindset of the period, where most people were indoctrinated to believe the teachings of an all powerful church. To search for exceptions to these basic principles would be to venture into the realm of the unknowable, since there are few or no other cases to compare with. When I find cases that are unique even within the three basic lay outs, they are noted as possible candidates for geometric design, but uncertain until a similar case have been found. The exceptions turn up over time as you work with this, but remain anomalies since the majority of swords easily comply to one of the basic structures with known strategies of geometric development defining the details of the design. Another thing that is important to point out is that it is *impossible* to reach any reliable results by analysing photographs of swords. At the very best you may arrive at a suggestion for a solution that must be verified on a direct documentation of the original sword, or second best a published drawing of good quality together with known dimensions. When you develop a geometric structure, use such strategies we know that the medieval artisans used. Look at good quality published work on gothic architecture and art. Keep in mind what aesthetic principles were valued and important to medieval artisans. This is difficult, but we can at least glean an insight from texts and surviving work from the period. I welcome others to do look closer at the exceptions to the common themes, but we must be aware that any results will be even more difficult to prove, since it is always at best be an exception to general practises. At the heart of my method is to search for (a small number of) common of basic solutions that define a majority of swords. From this work I hope that it will be possible to gradually zoom in on something that may eventually be accepted as possible and perhaps even probable. A definite proof of my hypothesis must wait untill an actual drawing is unearthed in some archive. I think the chanse of this is very slim, since sword plans most likely would have been made on perishable materials, without any intention of saving them to posterity. It is not like the plans of a cathedral that must survive generations of builders. I have certaily neglected to comment on several ideas, comments and suggestions that have been made in this thread. I welcome anyone who is interested to learn more about my hypothesis to read the articles I have published. In these many of the questions in this thread have been dscussed or at least touched upon. Sword #1 among the three experimental examples is the one that is not based on any geometric or modular design. The first clue to this is that it will not fit a layout of linked circles with the pommel and the point of the blade touching the periphery of the first and last circle. The amount of "tweaking" you can do is the height of the guard: it can be paced so that its front or back edge touches a defining line or so that it hovers somewhere over this defining line. I have shown all the different positions in the illustration with the minimum and maximum outlined in red. Posted: Sat 04 Feb, 2017 9:09 am Post subject: Sword? I have a short sword and Pakistan is etched on the blade. I would like to know what it actually is. Posted: Sat 04 Feb, 2017 9:14 am Post subject: Re: Sword? I think you must have posted on the wrong thread? Sword #2 is based on a the II structure of 8 interlocked circles giving a 3:15 ratio between hilt and blade, with the guard placed in the vesica formed by the first and second circle. The blade width is defined by two arcs that are tangent to a half circle drawn from the middle of the left side of the square. The tangent arcs cut the right hand side of the square according to the golden section. The same cut also defines the width of the pommel. The height of the pommel and the width of the guard are both defined with the same geometric construction. One leg of the compass is placed in the middle of the vesica and the other leg is placed in the middle of the upper or lower side of the square. The arc that is drawn marks the base of the pommel A circle with its centre in the large circle and its periphery at the base of the pommel transfers the proportion and defines the width of the guard. If a rectangle is made that has the height of the square and the width of this circle, it will have the proportions of the golden section. 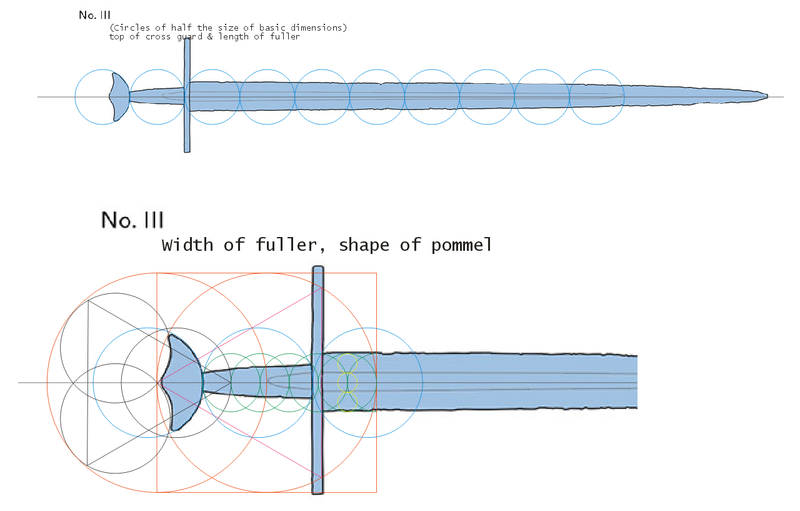 In this way, all the further details of the sword (apart from the basic 3:15 ratio of hilt to blade) are based on the principle of the golden section. However, you may note that the numbers 3 and 15 are both part of the fibonacci series of numbers that are used as a quick way to define the golden section (1, 1, 2, 3, 5, 8, 13, 21...). The golden section can be found by combining pairs of fibonacci numbers thus: 1/2, 2/3, 5/8, 8/13, 13/21 and so on. The higher numbers used, the closer to the actual value for the golden section you get (1.618.....). 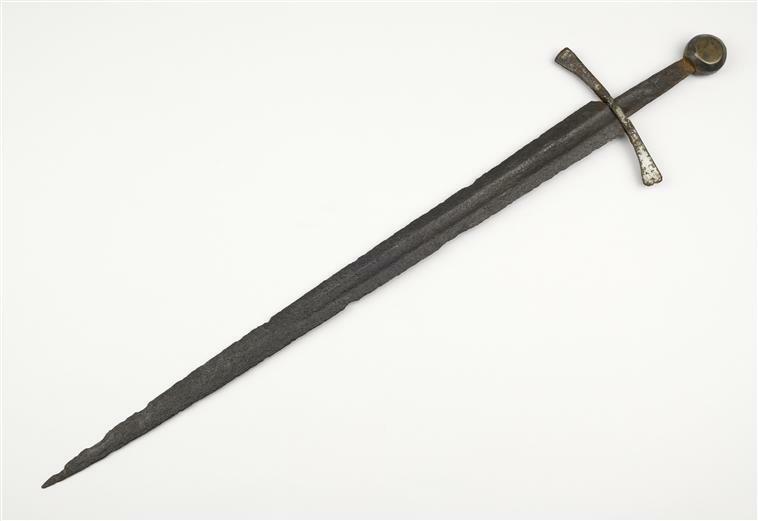 Sword #3 is a classic example of a sword of a kind that often is defined by a type I geometric structure. 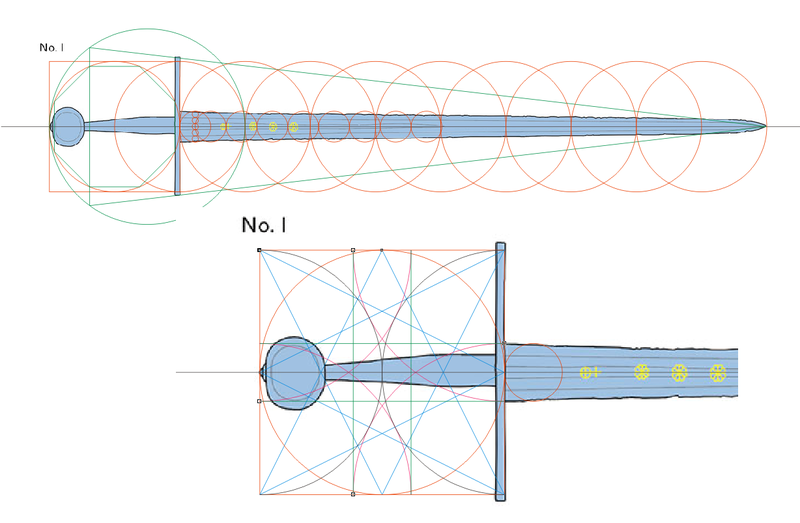 In type I structures the guard is placed in the middle of the first circle and defines the hilt to blade ratio by adding a series of interlocked circles with a diameter that equals the radius of the first circle. In this case the ratio of hilt to blade is 2:15. The blade width and the height of the guard are defined by a pair of inscribed octagons in two of the small circles. 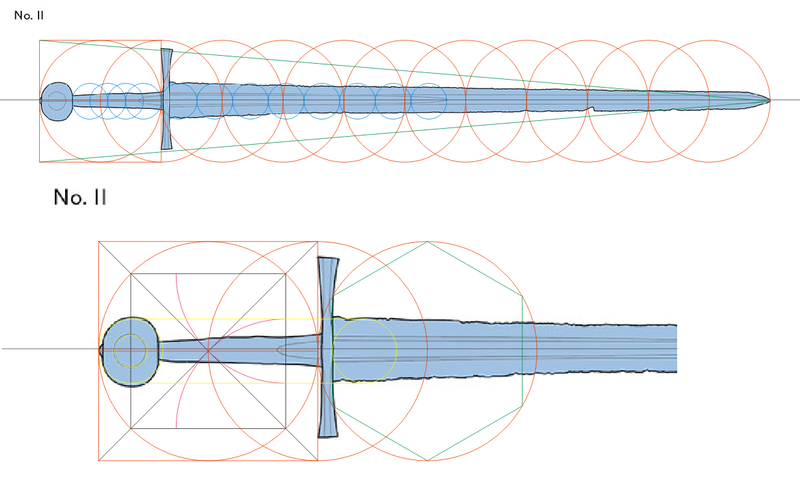 The blade width is defined by the width of the side of the octagon, while the height of the guard is defined by the distance between the sides of the two octagons. These are two very common strategies used for swords of this time period. 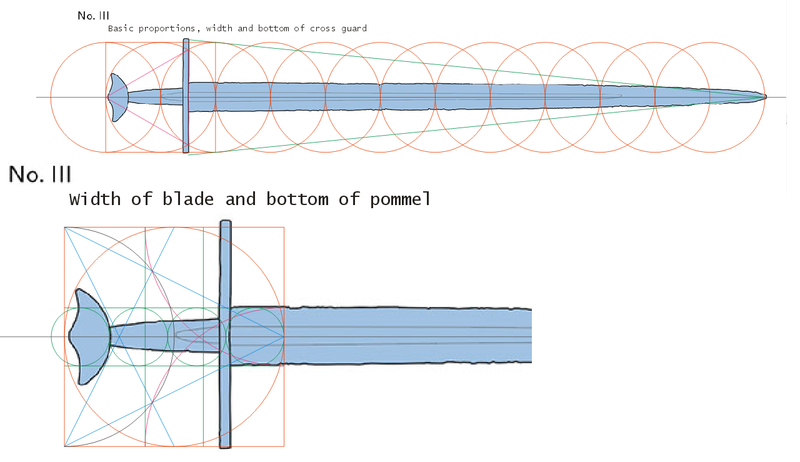 The width of the guard and the base of the pommel are defined by a pair of diagonal arcs of the square. The inner curvature of the pommel is defined by a circle that is constructed with the help of a square that is based on the width of the guard. This is another very common strategy that is valid for many other swords of this general type (brazil nut pommels and cocked hat pommels).